What if you didn’t have to set the table more than a stack of plates and a few napkins? I know, right!? What if you were able to stand up and chit chat through an entire party, and enjoy what was going on instead of slaving over the stove? Ever been to a festival and loved the idea of ANYTHING on a stick? To start, think easy salads that you can get at your favorite cafe in vertical form! Ham cubes and melon balls skewered. Or that devilishly caloric caprese salad becomes a wonderfully portion controlled bite when you string mozzerella balls (a.k.a. bocconcini) with cherry tomatoes and rolled basil leaves on toothpicks. For extra flair, drizzle with your balsamic vinegar and olive oil. 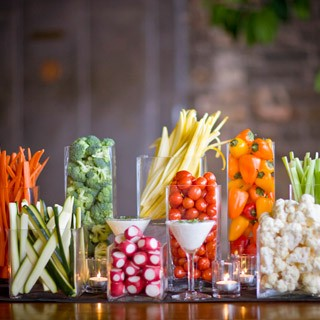 I love to save a dime when it makes good sense and what’s better than combining your centerpiece with your starts by putting Crudites in vases for a centerpiece with hummus, cheese and ranch dip. I think that it makes an amazing geographically modern look and feel, and if you have leftovers, think salad for the next day! 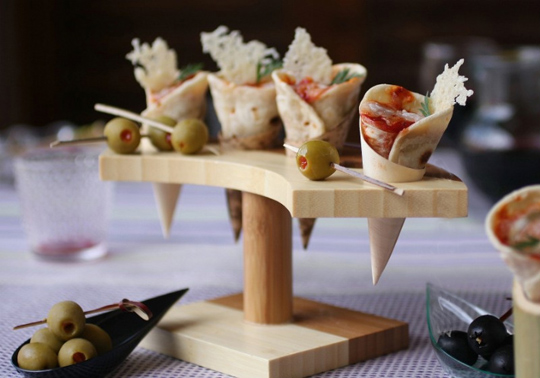 If you’re feeling a little more indulgent, try Pizza cones, these little beauties would be a hit with the kiddoes attending your fete as well! Main course on a stick? Sure! Why not? Let the mingling continue! Think roasted veggies skewered into edible rainbows of delight. Chicken satay skewers with a delectable, even if store bought almost homemade, peanut dipping sauce? Perhaps string beef and onion and peppers on your favorite metal skewers, grill with your favorite marinade and serve to your happy carnage eating friends. And then when the need for anything dipped in delectable melted butter strikes, marinade shrimp in a little garlic and parsley, and voila!, shrimp scampi pops into the fabulously upright food fest. And let’s not forget to stick the ending! What if you could just imagine up a lovely ending such as pound cake cubes with strawberries and a lovely whip cream topping? I smell a beautifully presented strawberry shortcake, don’t you? Even more exciting and guest enthralling is the idea of having a S’mores Station on the table !! I know, right? Little cans of sterno, all the fixins – and people, let’s shake it up – a few flavors of graham cracker…a few types of chocolate or even a peanut butter cup or two thrown in for variety. 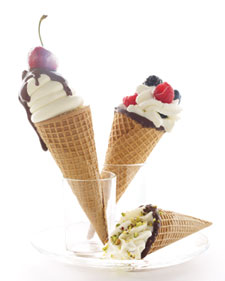 I’m also loving these super easy Canoli cones. I mean who doesn’t love feeling like a kid again, but reincarnated with those lovely grown up flavors. Plus the presentation factor can get upped a million different ways here – toasted coconut, party theme appropriate sprinkles (yes, those can be grown-up too!!) or a good drizzle of a caramel or chocolate sauce. Make this happen, and you’ll make people happy! This entry was posted in Recipe, Weddings & Events. Bookmark the permalink.